On paper, this is a 2-in-1 laptop which has it all: a 4K touch-screen display, fast CPU and PCIe SSD, powerful Nvidia discrete graphics and generous connectivity options. Unless Lenovo has got something horribly, horribly wrong, the Yoga 730 15in should be the Dell XPS 15 2-in-1 rival we’ve been waiting for. 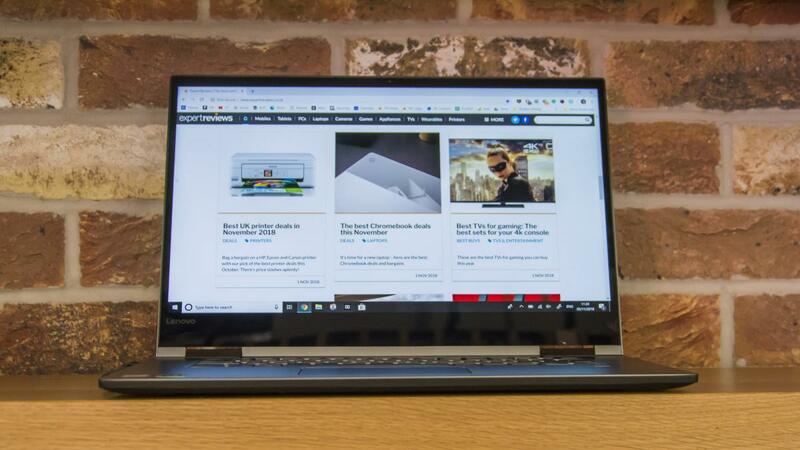 Quite a few of Lenovo’s Yoga laptops have been svelte, lightweight devices – the kind you see Lenovo’s marketing models holding nonchalantly in the palm of their hand. Well, they might think twice with this 2-in-1. Compared to the 14-inch Yoga 530 I reviewed earlier this year, the Yoga 730’s 15.6in display and beefed-up specification add a noticeable bit of heft to the proceedings – it’s not outlandishly heavy at 1.89kg, but it’s no lightweight. With a 15.6in touch-enabled 4K display, an 8th-Gen Intel Core i7-8550U CPU, 16GB RAM and discrete Nvidia GeForce GTX 1050 graphics, there’s no shortage of power on tap. The model I’m reviewing here also has a hefty 512GB PCIe SSD of storage, and runs on Windows 10 Home, as do all other configurations. The laptop even comes with a bundled stylus, the Lenovo Active Pen 2, so it’s ready for more creative endeavours right out of the box. The Yoga 730 15in starts at £1,099 for the base-spec model. For that money, you won’t get anywhere near the performance achieved by the review model on test here, but it will still be pretty formidable. That version has an Intel Core i5-8250U processor, 8GB RAM, 256GB SSD and a 2GB GTX 1050 graphics card – as opposed to the 4GB in the top spec. The touchscreen is also only Full HD (1,920 x 1,080) as opposed to 4K. The highest specification currently available is the one I’m reviewing here, and it costs £1,500 – which isn’t too steep a price hike considering that you get a 4K display, Intel Core i7-8550U, 16GB RAM, 4GB GTX 1050 graphics card and a 512GB SSD. However, in this price range, there are some serious 2-in-1 rivals. First and foremost is the Dell XPS 15 2-in-1, the class-leader in hybrid laptops. The entry-level model costs £1,699 and you’ll get a nippy Kaby Lake G Intel Core i5-8305G CPU, and surprisingly long-lasting battery life – although the base model display is only Full HD. For a 4K display model, you’re looking at a whopping £1,999, minimum. 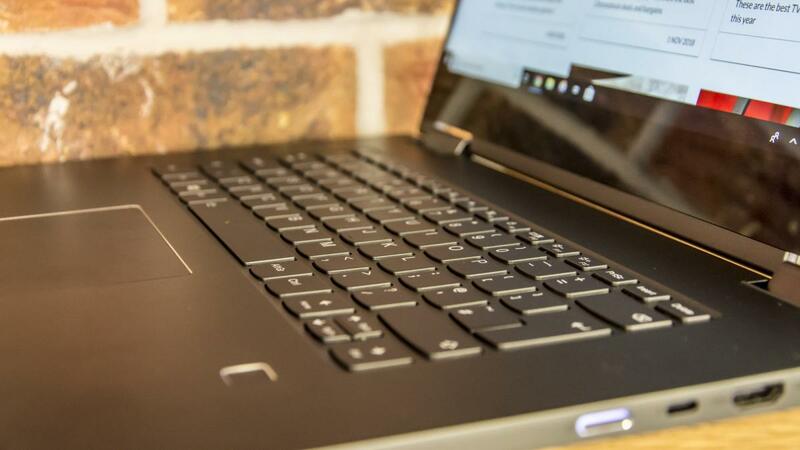 The overall design is far from subtle – it looks like a big slab of metal connected to another big slab of metal – but the polished aluminium chassis gives the laptop a solid, weighty feel. You’d better like grey, though: Iron Grey isn’t the most exciting colour I can think of, and it’s the only finish available for the Lenovo Yoga 730. 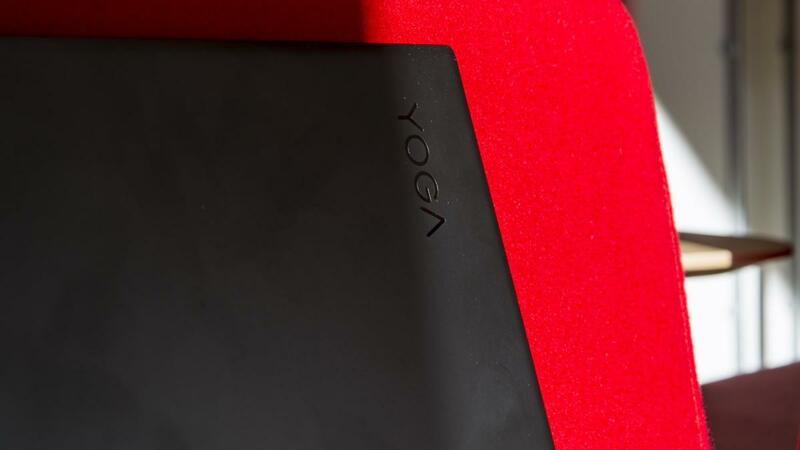 At 1.89kg, it’s actually quite light for a 15-inch laptop, and the Yoga design works just as well as ever. 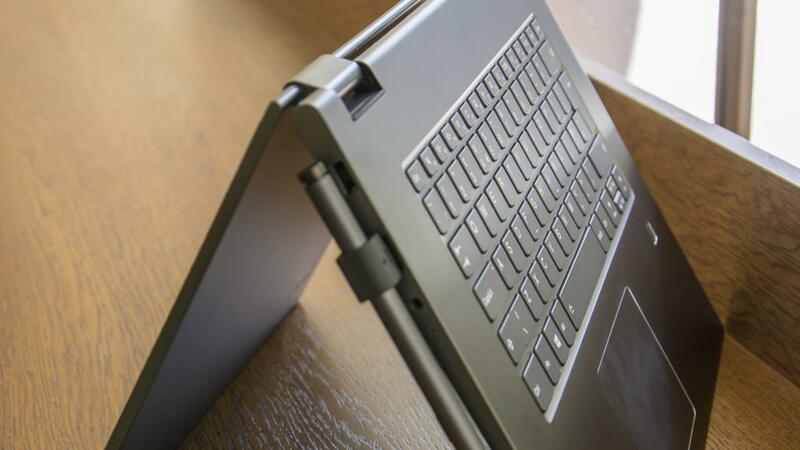 The solid hinge allows it to smoothly flip from laptop to tablet and back again. You certainly notice the extra few inches of screen size, though: it is somewhat unwieldy to fold into tablet or tent mode compared with its lighter Yoga counterparts. The dimensions also make it difficult to use when space is limited. Measuring 36cm wide, it’s tricky to use on the fold-down table of a South Western train, for example. Lenovo doesn’t leave you wanting where ports are concerned. On the left-hand-side there ’s a dedicated power connector, a USB 3.0 port and 3.5mm audio jack; on the right, another USB 3.0 port, a USB-C (Thunderbolt 3) port and a full-sized HDMI slot. Beneath the backlit keyboard, you’ll find a fingerprint reader, while on the underside you’ll find a pair of JBL Premium speakers. They’re plenty loud enough, but when playing music I found the audio to be lacking in clarity, especially once you step away a few paces. Still, you could happily watch a film without the need for a Bluetooth speaker. 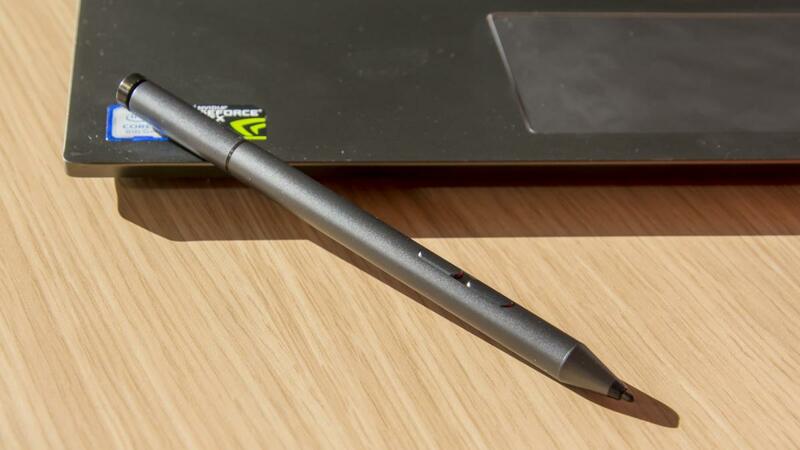 Unlike the likes of Microsoft and Apple, Lenovo has bundled in its stylus, the Lenovo Active Pen 2 (worth £40) for free. To keep it attached to the laptop you need to plug a pen holder into one of the USB 3.0 slots, which is a tad unsightly. 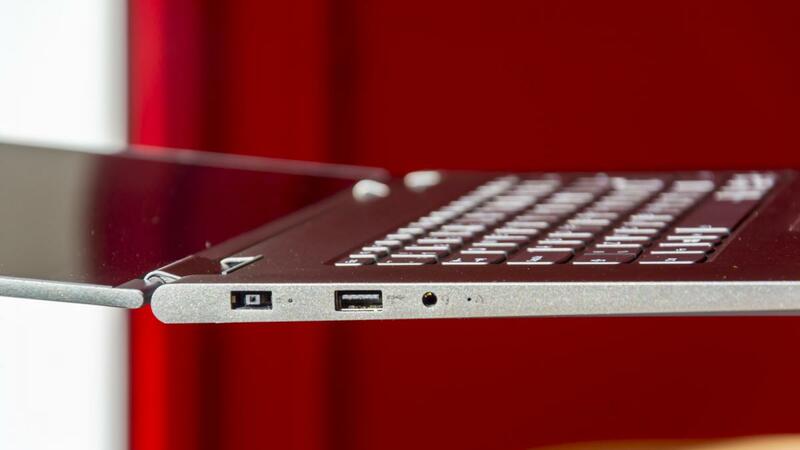 Alternatively, you can rest it magnetically on the base, just below the touchpad. Why only there, I have no idea – it’s about the least practical place, as it prevents your wrist from resting properly on the base. The keyboard on the Yoga 730 15in is nice and spacious, but the keys more vague than I’d like. Given the sturdy build quality, I was hoping for something a little closer in feel to Lenovo’s ThinkPads. Still, there are no problems with the layout, and the curvy, rounded design of each key feels good under the fingertips. It’s got two levels of LED backlighting, too. As for the touchpad, it’s does the job just fine. I found it sensitive and accrate, and was able to execute Windows shortcuts with minimal effort. It’s of a nice size, too, and is inset enough that your fingers won’t run off the touchpad, even though the surface itself is extremely smooth. The Lenovo Active Pen 2 works well too. It’s quick and simple to connect to the laptop, and there are left and right buttons as well as a shortcut button at the top of the pen, which you push downwards using your thumb like on a retractable biro. In fact, the only issue comes when you try to insert the batteries; it took me two fiddlesome minutes to unscrew the two separate compartments on the pen and fit the three tiny batteries inside. The display is a high point: the 4K, 3,840 x 2,160 IPS panel looks incredible, and 4K playback on Netflix and YouTube is exceptionally vivid and crisp. To the naked eye, you’re unlikely to want for more. Our display calibration tests revealed that it’s far from perfect, however. The display produces only 82% of the sRGB colour gamut, which is below par for a premium laptop. Colour accuracy isn’t great, either, and the average Delta E of 3.08 means it isn’t accurate enough for pro-level image and video editing, which is odd considering that it is aimed at people who’ll be using it for those very purposes. Screen brightness is disappointing, with a maximum measured luminance of 282cd/m2. In an ideal world, this would be around the 400cd/m2 or above so that it wouldn’t suffer from glare when using outdoors, beside a window or under harsh indoor lighting. The contrast ratio of 1,322:1 is respectable though. For a £1,500 laptop, the Lenovo Yoga 730 15in puts in a typically solid performance. 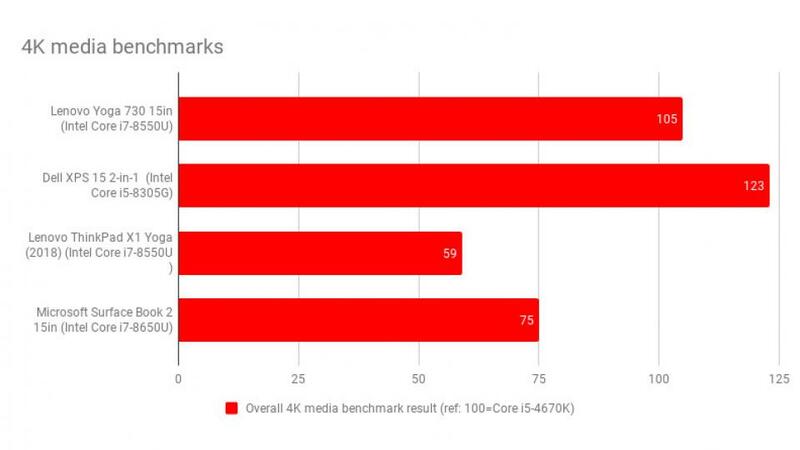 With a Kaby Lake R Intel Core i7-8550U CPU and 16GB RAM, it achieved an overall media benchmark score of 105. That’s not too far off the 123 scored by the reigning hybrid champion, the Dell XPS 15 2-in-1, which pushes ahead thanks to its better-performing Kaby Lake G Core i5 CPU. File sequencing speeds on the Yoga 730 15in are sensational – it has its 512GB PCIe SSD to thank for that. In our AS SSD benchmark, it read files at a rate of 2,432MB/s, and wrote them at 1,907MB/s. 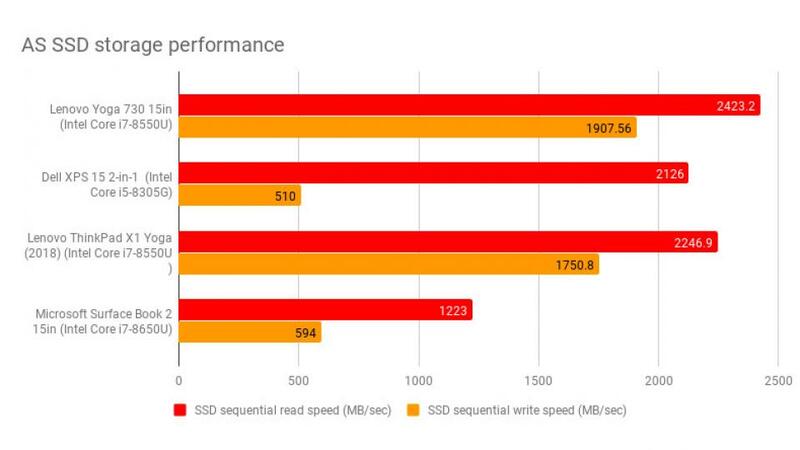 As seen in the chart below, this is faster than the Dell XPS 15 2-in-1, the Microsoft Surface Book 2 and the ThinkPad X1 Yoga, a machine specifically designed for business-standard sequencing speeds. With its discrete Nvidia GTX 1050 graphics card, the Yoga 730 15in zooms ahead in the graphical benchmarks compared to most rival machines. In the Metro: Last Light 1080p test, for example, the Yoga 730 15in ran at an average of 46fps. The Microsoft Surface Book 2 ran at 26.1, while thea Lenovo Yoga 530 (with Radeon Vega 10 graphics) averaged just 18fps. 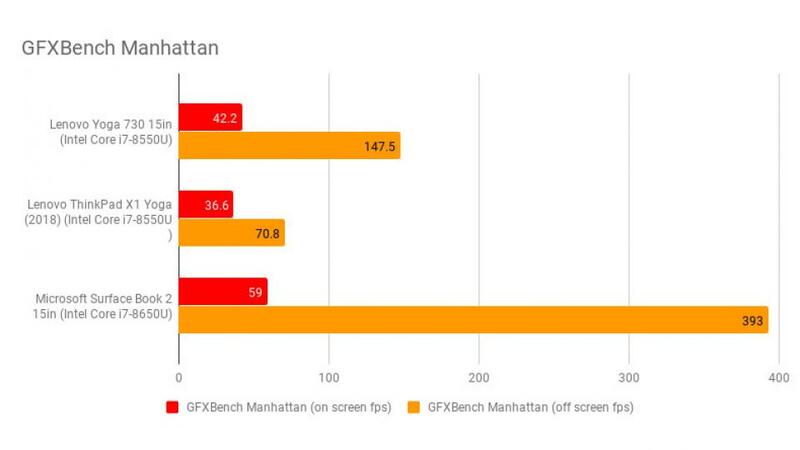 As shown by the chart above, the Yoga 730 15in delivered more than competent results in the GFXBench Manhattan tests, with an on-screen of 42fps and off-screen of 147.5fps. There’s a lot of power here, and provided you keep the settings to 1080p you’ll be able to get away with playing almost any game you’d like, included newer Triple-A titles. Try to run them at 4K and you won’t have much fun, though. 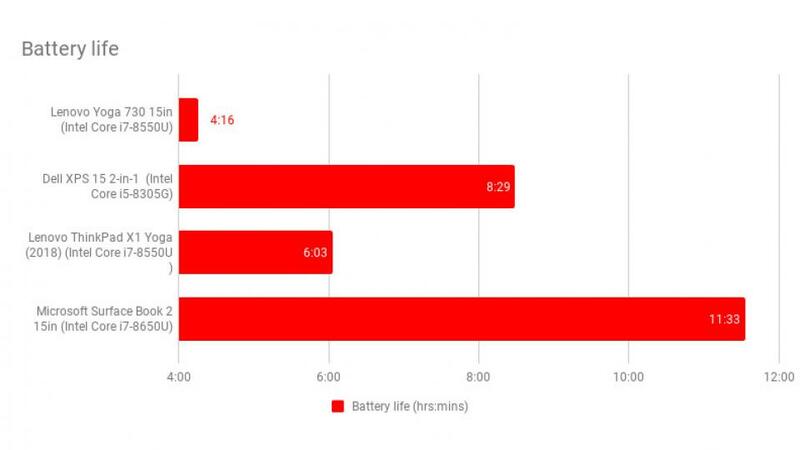 The battery life of the Lenovo 730 15in is, as expected, not great. On a full charge it lasted 4hrs 16mins in our standard video playback test – almost exactly half that of the Dell XPS 15 2-in-1, which went for 8hrs 29mins. Keep in mind, though, that this model has a 4K screen, which soaks up a huge amount of power, whereas the XPS 15 2-in-1 we tested only had a 1,920 x 1,080p display. If you do buy the Lenovo Yoga 730 15in, you won’t want to leave the house without your charger. 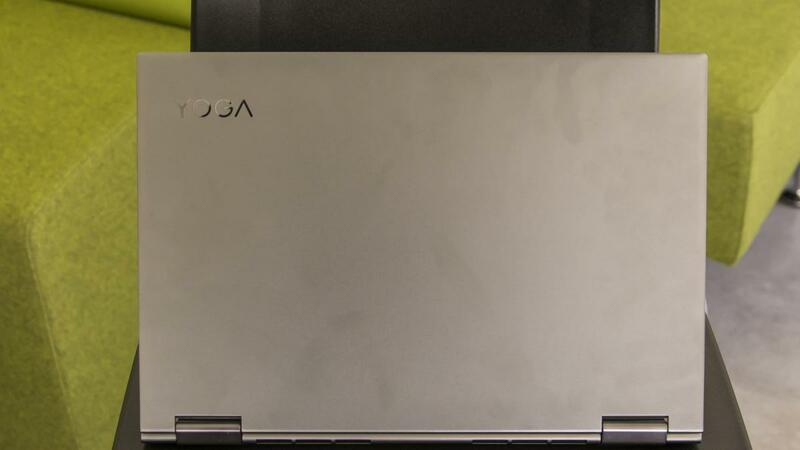 The unassuming Iron Grey chassis of the Lenovo Yoga 15in houses a seriously powerful laptop. And while £1,500 might sound like a lot of money, it’s actually quite reasonable considering what’s on offer. With A 4K touch display, powerful CPU and blazingly fast SSD, and decent gaming capabilities, it’s a true all-rounder. The nice array of ports and bundled-in stylus sweeten the deal. It’s not perfect, though: with poor battery life, modest screen brightness and middling colour accuracy, there’s plenty of room for improvement here. The only real rival here is the Dell XPS 15 2-in-1, but even the entry model is £200 more expensive, and even then you’d only get a Full HD display. If you’re looking for a capable 15.6in laptop that can turn its hand to almost anything, then the Lenovo Yoga 730 15in is a good choice.